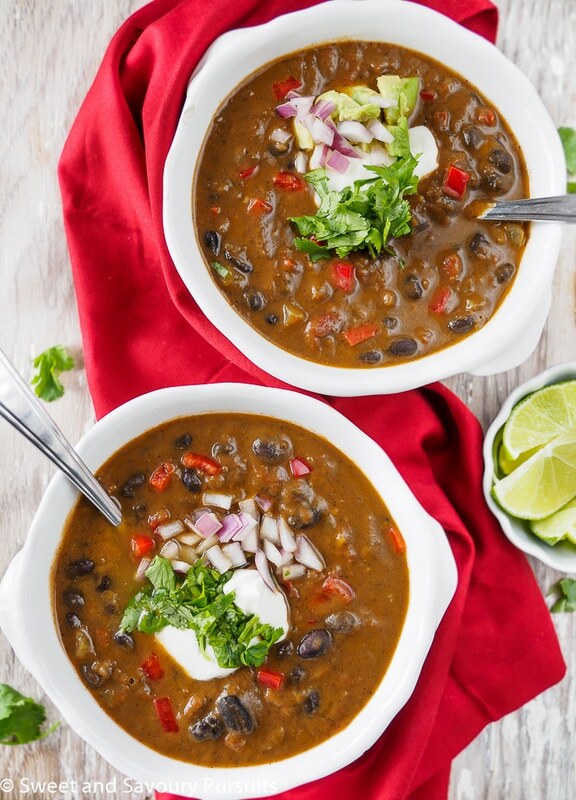 This Southwestern flavoured Easy Black Bean Soup is super delicious, hearty and healthy. Make it with canned black beans for an easy one-pot meal. Today I’m sharing one of my favourite soup recipes. I’m a big fan of soups, I think they’re perfect for lunch and dinner. I know that as long as I have some good quality boxed broths, canned beans and a few other staple ingredients, I can get a delicious and healthy meal on the table quickly. This is such an easy black bean soup to make and can easily be made vegetarian or even vegan by using vegetable broth. Using canned black beans means this soup can be prepared quickly. Not only is this black bean soup super delicious but it’s good for you too. Did you know that black beans are naturally low in fat, high in fibre and protein and are a very good source of essential vitamins and minerals? This soup can be puréed entirely for a creamy black bean soup, or you can purée only part of the soup (that’s how I made it), or again just leave it as is. It’s delicious which ever way you choose to eat it. If you decide to purée some of it, I highly recommend adding a couple of tablespoons of fresh cilantro leaves along with the beans and veggies, the fresh cilantro adds so much flavour to the soup! 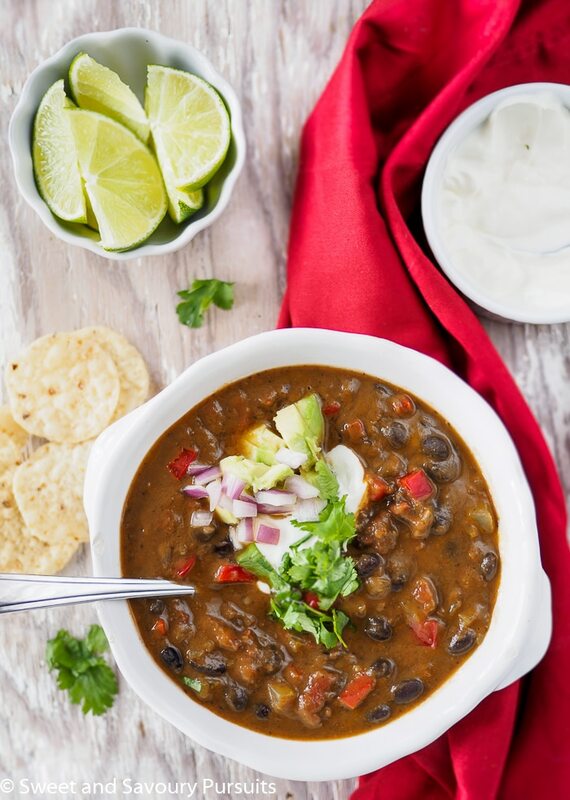 This Easy Black Bean Soup can be made even more delicious by topping it with a variety of garnishes such as sour cream, shredded cheese, red onions, avocado, cilantro, and crushed tortilla chips. Enjoy! 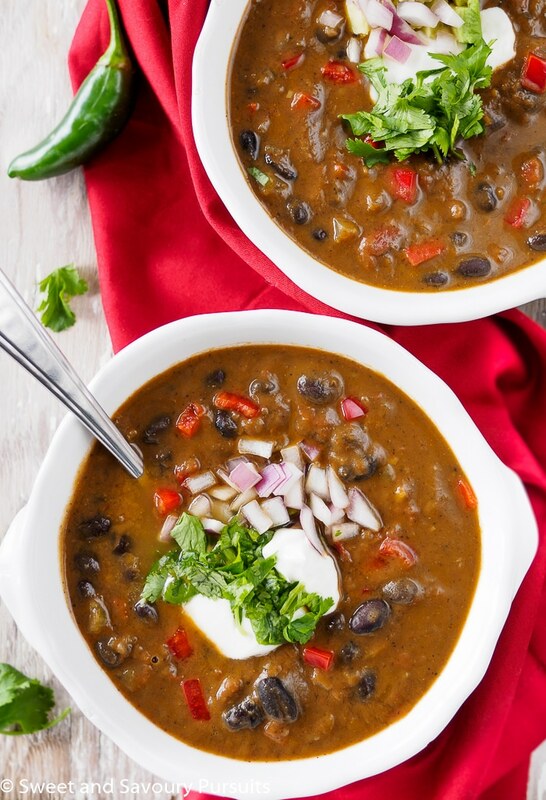 This Southwestern flavoured Easy Black Bean Soup is delicious, healthy and hearty. Make it with canned black beans for an easy one-pot meal. In a heavy-bottomed pot, heat the butter and olive oil over medium-high heat. Add the onion and celery and cook for 2 to 3 minutes before adding the red pepper, jalapeno and garlic. Lower heat to medium and cook, stirring every few minutes, until vegetables soften, about 6 to 8 minutes. Add all the seasonings,and then the drained black beans, stir the beans with the vegetables and seasonings. Add the stewed tomatoes with their juices, stir and then add 5 cups of broth. Bring the soup to a boil, reduce heat and let the soup simmer for 15 to 20 minutes. Taste soup and adjust seasonings. If desired, you can purée part of the soup in your blender and return it to the pot. If soup is too thick, add one more cup of broth to thin out soup. Before serving, add 1 to 2 tablespoons of freshly squeezed lime juice to the pot of soup. Optional toppings are not included in the calculation of nutrition facts. Wonderful, it you have a chance let me know how you liked it. This is so very tasty! I love the combination of flavors and the fact that is an easy to prepare recipe. Thank you so much Florentina. I agree, I love simple recipes that deliver on ease of preparation and taste delicious! A delicious soup any time of the year but especially good during the holiday season when everyone is so very busy. Exactly, once you’ve got all the ingredients chopped up and in the pot, a soup is pretty hands-off cooking! This looks so delicious, I love black beans. Thank you, so do I! I LOVE Black Bean Soup, especially when it’s cool outside! This soup looks so good! Thanks Nancy! I just love beans in soups, they’re just so tasty! Fida, I love black bean soup and this one looks delicious, especially with those garnishes. I am definitely going to make it one of these days. Thanks!